Join in the valiant battle to end the ultimate stalemate of good vs. evil and etch the final outcome into history. Regnum Angelica is a two-player strategic card/board game pitting Gabriel and his army of archangels against Beelzebub and the dark forces of the fallen. Wield the three elements of fire, earth and water in angelic combat, use ancient angelic scripts to gain an advantage over your opponent, or deploy pillars to protect your troops in an attempt to infiltrate the enemy's realm. 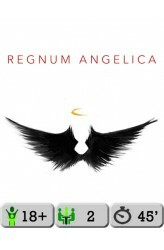 Regnum Angelica is played with one player having the white deck to represent the archangels of Gabriel, and the other the black deck to represent Beelzebub and his army of fallen angels. Each deck consists of three types of cards: Angels, which are your main combat units; Angelic Scripts, written ..